A bridge between people and the past. Each Hope College department gives us its official records for posterity. Learn what's new about what's old. We are proud to be part of Hope College's award-winning library. Search inventories, registers, indexes and guides to our collections. To access the materials you find, you may need to visit the Joint Archives in person. Note: Single word searches are the most productive. Find physical books and periodicals in the Hope College library catalog. Search terms: Location: Choose a location: Theil Research Center All Hope College For more options, try an advanced search. The Joint Archives of Holland is a department of Van Wylen Library and promotes the educational mission of Hope College and its partner institutions by actively collecting, caring for, interpreting and making available the unique historical resources in its care. These resources include the archival collections of Hope College, Western Theological Seminary, area governmental units and other members who contract for services at the Joint Archives of Holland. 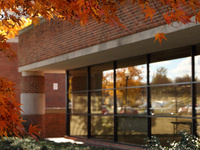 It serves as a research center for students, faculty and staff of Hope College, for contractual members of the Joint Archives of Holland and for the general public. Ask the archivistOur archivist has the answers. Call, email, or ask in person. We publish the official minutes and agendas for Hope College. Prior to the founding of the Joint Archives of Holland, archival work was done by volunteers and part-time staff at Hope College, Western Theological Seminary, the Netherlands Museum and the City of Holland. We measure the shelf space necessary to store documents in linear feet. A linear foot is twelve inches wide for documents stored on edge, or twelve inches high for documents stored horizontally. Although the Joint Archives is a department of Van Wylen Library at Hope College, we also collect materials for institutional partners like Western Theological Seminary. Geoffrey Reynolds joined the archives staff over 20 years ago and has yet to be stumped by a single research question.